Do you know how to do quilling, or even what paper quilling is? 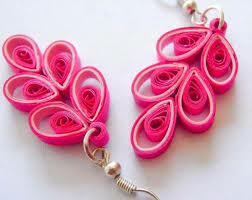 In this article, I am going to discuss how to do quilling as well as look at the history of paper quilling, paper quilling supplies and paper quilling designs. What the hell is paper quilling you may ask? Well, quilling is the art of taking thin narrow strips of paper and rolling them into various delicate shapes and designs. Paper quilling originally dates back to the 15th century when people from the poorer religious houses of the Mediterranean would wind strips from the edges of their bibles around goose quills. This, in turn, produced rolls of paper which were then pinched into shape and used to decorate religious pictures. At the end of the 17th century, paper quilling was used to decorate walls of homes and in Regency times ladies would decorate their fire screens, cribbage boards and vases using this technique. In the Victorian era, furniture would be specially made with recessed panels to allow ladies to use them to display examples of their quilling handy works. Did you know that some people call paper quilling ‘thrilling quilling,’ as you can do so much with paper quilling once you have learned the basics? 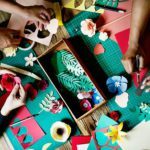 Quilling is quite popular with card makers, but there is no reason why you shouldn’t use the art of quilling to complement your scrapbook layouts or even your card making efforts. 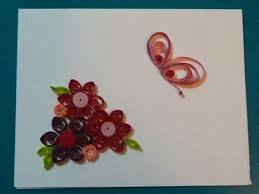 Paper quilling is a wonderful way to decorate and make embellishments for your scrapbook layouts and it is a creative way of playing with paper. If you are wondering how to do quilling, or if it is difficult to do, read on. To start with quilling, you would need a quilling tool, which is a fine plastic or metal rod with a narrow slit at one end like this one below. Click on the link or pic if you want to find out more about how to get yourself a tool. You could also make your own quilling tool by sticking a large wool needle into a cork and snipping off the top of the eye to form a prong. The prong needs to be about 10mm deep in order to hold the widest quilling strips. You could also start with a bamboo stick or a toothpick. You would then thread a fine paper strip (minimum of about 3mm wide) into the prong on the quilling tool and start coiling the paper round and round, holding the end of the paper with your thumb and forefinger to keep an even tension until you reach the end of the strip. Slip the coil off of the tool and let it relax according to your needs before applying a tiny dab of glue with a cocktail stick to the end of the coil and sticking it down. Quilling projects usually start with the making of individual shapes most of which include a basic circle. The shapes then fit together in different ways to create interesting designs and patterns. You need just master a few shapes before you realize that the only boundaries you will have with quilling will be in your imagination. To make a leaf, for instance, start by making a closed loose coil. Pinch one side of it into a point between your thumb and forefinger. Then hold the pointed end of the teardrop in one hand and repeat the pinch on the other side thus turning the round shape into a leaf shape. To make a heart, fold the paper strip in half and then roll each end of the paper in your quilling tool inwards. When you reach the fold slip the quilling tool out and allow the coil to loosen slightly then glue together to form a heart shape. These hearts can be made in different sizes by just varying the length of the original strip. These little hearts are especially effective as accents on cards or scrapbooking layouts. The looser you make the initial coil, the larger your shape will be and the tighter you make the initial coils, the smaller and more compact your shape will be. This book is the beautiful work of four experienced paper crafters. Beautiful quilling will give you all the inspiration and knowledge you will need to make your own fantastic quilled craftwork. Click on the picture to find out more on how to do quilling. Try experimenting with quilling, and you may just surprise yourself at how much you actually enjoy it. Below are some more paper quilling supplies that you can check out by clicking on the pictures. Here are a few videos for you to get started with on some paper quilling designs. Easy Paper Snowflakes - Get The Family Busy! Next Post Addi Knitting Machine – Review Before You Buy!